MorphoTrust USA announced that it has signed contracts to provide fingerprinting services for the New York State Division of Criminal Justice Services and the West Virginia State Police. The services will be provided through the company’s IdentoGO Centers to support the vetting of individuals applying for jobs or licenses in childcare, finance, law enforcement, nursing, education and other fields where fingerprint-based background checks are required by law or regulation in these states. The contract signed with West Virginia State Police will cover secure fingerprint capture services for all individuals in the state who are mandated by legislation to undergo criminal history background checks, for example teachers, nurses, volunteers, foster and adoptive parents. The agreement is the result of a successful re-bid for a contract MorphoTrust previously had with the state police, and is designed as an annual contract with six one-year extension options. IdentoGO Centers by MorphoTrust currently process 70,000 applicants annually in West Virginia, and that number is expected to grow to 80,000-90,000 per year. MorphoTrust will expand the number of IdentoGO Centers to 27 locations statewide to provide even more options to West Virginians. MorphoTrust entered into a new contract with New York State Division of Criminal Justice after being the successful bidder for its Managed Civil Fingerprint Capture System. The company has contracted with New York State since 2009 to provide fingerprinting services to employers, agencies or other entities required by law or regulation to conduct fingerprint-based background checks on prospective employees or those seeking certain licenses. MorphoTrust estimates it will serve approximately 450,000 individuals annually, including those applying for jobs with, or seeking a license from 44 New York State agencies, authorities and boards. GO-Trust announced the launch of the GO-Trust iReader and SDencrypter for iOS. The iReader is an iOS reader that connects to any iPhone or iPad with a lighting connector. 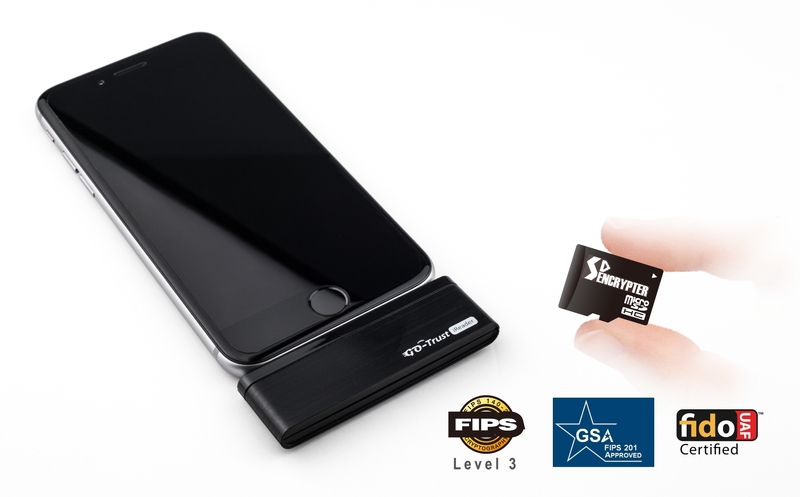 It provides a microSD expansion slot that can support FIPS 140-2 Level 3, FIPS 201, BCTC and FIDO certified microSD secure elements using the GO-Trust SDencrypter — which includes up to 16GB of user flash memory — or 128GB of dedicated memory expansion. The GO-Trust SDK for the SDencrypter is compatible with the Apple iOS. The iReader is multifunctional and can also connect to Windows and Android devices using a supplied USB cable. The iReader will be available for shipment in April. Crossmatch announced that the European Commission, through the European Asylum Support Office (EASO), has awarded Greece funds to purchase Crossmatch L Scan palm scanners. The devices will be used at Greek border crossings and established hotspots on the islands of Lesvos, Chios, Leros, Kos and Samos to ensure proper identification and registration of migrants. The Federal Police in Greece are using biometrics to enroll and ensure proper identification as refugees cross their borders. Images from the Crossmatch scanners are used to create submissions to the EURODAC database. EURODAC is the European database for identifying and registering asylum seekers and irregular border crossers. It ensures the sharing of information among EU member countries and determines if asylum seekers have already applied elsewhere. The EASO award follows the announcement in December that the Bundesamt für Migration und Flüchtlinge (BAMF), the German Federal Office for Migration and Refugees, has deployed Crossmatch Guardian fingerprint scanners to biometrically enroll thousands of refugees and migrants entering Germany. To date, BAMF has purchased over one thousand Guardian devices that are deployed at more than three-dozen field offices where refugees are fingerprinted and asylum applications are processed. Centrify, a provider of enterprise identities systems, announced Multi-Factor Authentication Everywhere, a new initiative aimed at securing enterprise identities against the most prevalent source of cyber attacks — compromised credentials. Centrify’s solution is designed to supports all types of enterprise users — including employees, contractors, outsourced IT, partners and customers — across a range of enterprise resources — including cloud and on-premises apps, VPNs, network devices, and cloud and on-premises servers. XTec AuthentXware enables PIV and PIV-I credential post-issuance and lifecycle maintenance activities such as card unlock, PIN change, certificate updates and card activation all from the desktop. By reducing the footprint of the hardware with the Hamster Pro Duo/SC, agencies can offer the ability to update expiring certificates on their identity cards enterprise-wide, reducing the risk of unnecessary card printing and improving business operations and efficiency. The first rollout of the smaller footprint for full card lifecycle management includes over 500 units for the Department of Homeland Security, which already uses AuthentXware Full Lifecycle Management at the desktop. Designed in partnership between XTec and SecuGen in order to complete XTec’s card lifecycle management offering for PIV and PIV-I customers, the Hamster Pro Duo/SC is SecuGen’s smallest fingerprint and card reader combination to date.